The Port of Hamburg has announced its 9 months 2018 results. The port achieved a total throughput of 100.8 mln tons, which is 3.4% below the 2017 level, due to lower volumes of bulk cargo and containers, although conventional general cargo slightly increased. Hamburg handled 6.6 mln TEU in January-September 2018, -2.4% as compared to the same period of 2017. This decrease happened mainly due to a drop in the empty boxes’ volume: 830,000 TEU, which represents a 10.1% downturn. The throughput of loaded containers (5.8 mln TEU) was just 1.2% below the previous year’s level. 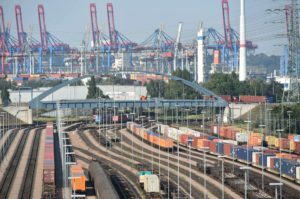 The Port of Hamburg highlights a strong growth of rail traffic: a total of 1.8 mln TEU were transported by rail between the port and inland intermodal terminals, marking a significant growth of 4.3% y-o-y and causing the rail traffic share to increase from 42.5 to 44.9%. The direct rail services between China and Hamburg, not involving any sea leg, also grew in 2018. Around 235 container train services are now offered weekly between Hamburg and 27 destinations in China. “Hamburg as Germany’s top China centre functions as the New Silk Road’s point of arrival and departure. In addition to more than 110 liner services with worldwide seaports, the Hamburg logistics region offers optimal conditions for rail, truck and inland waterway distributor transport, and for clearing air freight,” said Axel Mattern, Joint CEO of Port of Hamburg Marketing. In total, the port handled 4.1 mln TEU in landside seaport-hinterland traffic. The container segment’s share in Hamburg’s hinterland traffic rose to 62.1%. The general cargo throughput was 68.6 mln tons (-2.3% y-o-y) and bulk cargo, which makes up one-third of total throughput, resulted in 32.2 mln tons, -5.6% y-o-y due to market factors that caused downturns in both suction and liquid cargoes. The upward trend in conventional general cargo, which was already seen in the last quarter of 2017, was now maintained in the first three quarters of 2018: +6.6%, up to 1.2 mln tons. Here, heavy cargo imports increased by 32.2% (218,000 tons), those of metals tripled, up to 115,000 tons and those of vehicles rose by 55% to 34,000 tons.